Chesterfield has the raw ingredients to adapt and thrive in the face of the national ‘retail apocalypse,’ claims the new owner of the town’s Vicar Lane Shopping Centre, ALTERIS. 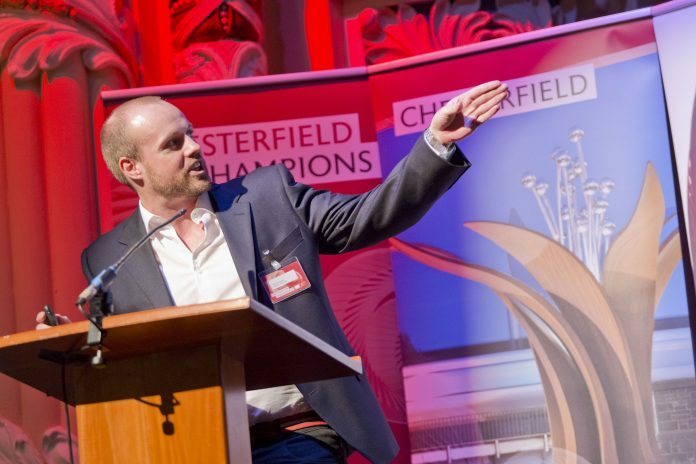 Mr Broadhead was speaking at the town’s popular annual Celebrate Chesterfield event, organised by Destination Chesterfield, and held on Wednesday 20 March at the Winding Wheel. The property fund company now has ambitious plans to transform the town’s Vicar Lane Shopping Centre which it bought out of administration last month. It plans to create ‘a new town centre retail model for the post e-commerce world’. Plans to develop Vicar Lane have been driven using Facebook, which ALTERIS is using to engage the local community and help them inform the redevelopment of the shopping centre. Colour, seating, events and high speed internet are all set to be introduced to Vicar Lane Shopping Centre over the next six months. ALTERIS has also identified independent retailers as being key to the future success of the shopping centre. Appealing to independent retailers attending the packed event, Bert added: “We want to work with local, independent retailers and have made a number of units available with short term flexible leases to support them.” Work on the new look Vicar Lane will start later this year. Supporting the drive to regenerate Chesterfield town centre, Huw Bowen Chief Executive of Chesterfield Borough Council revealed that the council will be submitting an application to the government’s Future High Streets Fund to sustain and grow footfall on the high street. As part of the funding bid, Chesterfield Borough Council plans to introduce universal Wi-Fi provision across the town centre. Last year the council approved plans to convert the former magistrates court into 32 apartments, create 10 apartments at 1-3 Knifesmithgate, demolish the former headquarters of North East Derbyshire District Council to make way for 64 retirement homes, and convert the historic building at 87 New Square into nine luxury apartments. Celebrate Chesterfield, now in its ninth year, is one of the biggest and most hotly anticipated business events in the area. This year the free breakfast event attracted nearly 300 delegates. Peter Swallow, Chair of Destination Chesterfield, said: “We must not underestimate the power of town centre living to increase footfall to enable us to adapt to the changing face of retail.